I have a soft spot for geodes. I like the idea that a plain looking rock could contain such beauty, a tiny world within it that becomes a two sided diorama when cracked. Elyse Graham loves them just as much as I do. She loves them so much, in fact, that she makes her own. 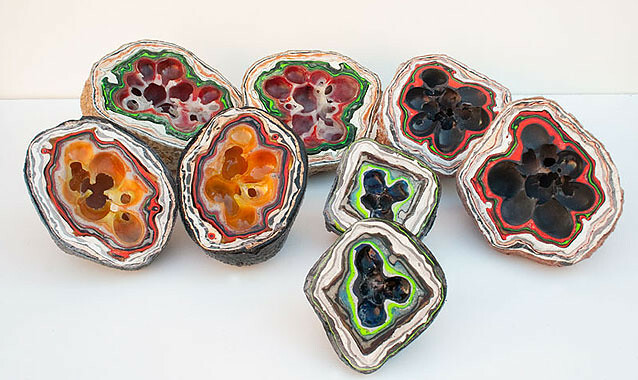 Using colorful latex, urethane, resin, sand and plaster around a bubble of exhaled breath, Elyse builds up these lumps and then slices them open, revealing the beauty within. 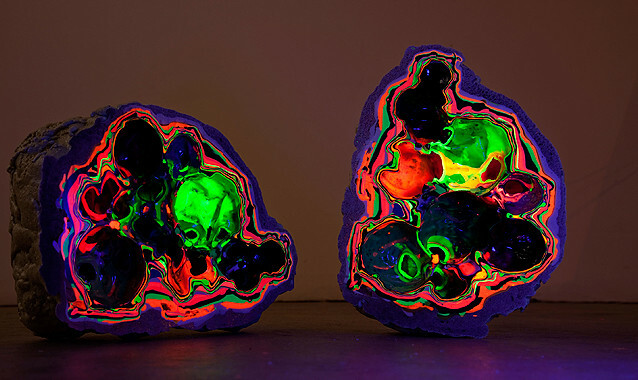 Some are phosphorescent or black light reflective, glowing in eerie neon colors, as do some of their natural counterparts. 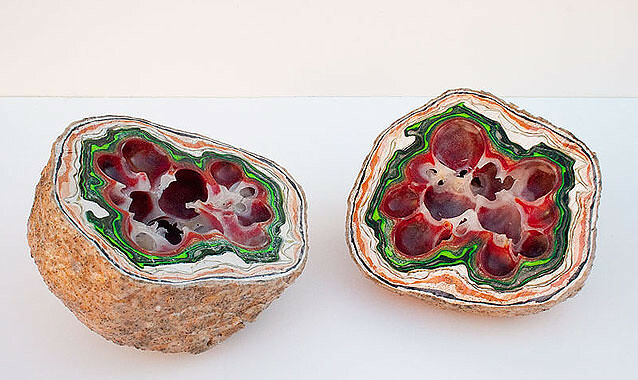 Geodes have been objects of wonderment for me since childhood. I was obsessed with the idea that I could go out into the landscape and pick up a rock that might just be filled with a magical surprise. I continue to be fascinated with the notion that seemingly ordinary objects have the possibility of harboring something unexpected and beautiful. 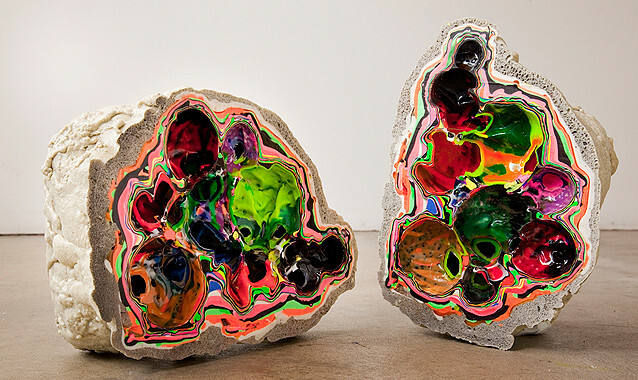 I am also interested in the geode as a time capsule—over time, a cavity is slowly encroached upon by outside elements, creating a history from the inside out. I build my geodes around the void created by my exhaled breath. When each piece is finished, there is no evidence of what may lay beneath its surface. As I create the piece one layer at a time, each time covering up the layer that preceded it, I have no idea what will reveal itself once the geode is split open. See more of Elyse's work at her website. Also, thanks to Caity Kennedy for sharing.